SD-06 is a MAPK p38 alpha inhibitor for the treatment of arthritis. SB 202190 inhibits p38 and p38β2 with IC50 values of 50 nM and 100 nM. respectively. R1487 is a p38 MAP kinase inhibitor with an IC50 of 10nM. UM164 is a movel potent, dual c-Src/p38 with Kd of 2.7 nM (c-Src), potently inhibits both p38α and p38β; inhibits c-Src autophosphorylation in TNBC cell lines. VX-702, one of a series of second-generation, is an orally active p38 MAP kinase inhibitors, for the potential treatment of inflammation, rheumatoid arthritis and cardiovascular diseases. 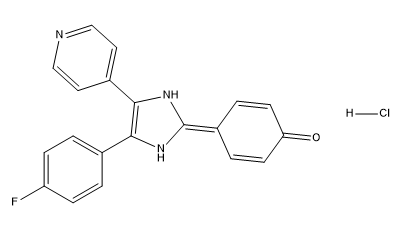 SB-681323, also known as Dilmapimod and GW-681323 , is p38 MAPK inhibitor. Dehydrocorydaline chloride is an alkaloidal that has anti-inflammatory and anti-cancer activities. Acumapimod (BCT197) is an orally active p38 MAP kinase inhibitor, with an IC50 of less than 1 μM for p38α.